The value of an image is almost equal to the value of a webpage. Why? Because Google’s image index treats every image as a single search result, the same way that web pages are a single search result. Images provide a lot of opportunity for developing in-bound links for your corporate website, so you should pay attention to how the images are marked up and deployed. Here’s why they are more important than you would think. There are two major search indexes dedicated to finding and cataloging Images and Graphics (Google and Bing). Search engines have a dedicated crawler for images. Google’s is called Googlebot-Image. Images are often featured in the first page of search results in the Universal search index. You see images in Google Maps. There are dozens of photo sharing sites where you can post images with optimized Meta data with links pointing back to your corporate website. Google’s local search index for businesses (Google Places) has options to upload ten pictures of your company. There are seven tasks you should think about when you are prepping your images for deployment within your website, or on photo sharing sites. Collectively they can improve your SEO footprint and help drive traffic to your website. File Names – Digital cameras will assign a very cryptic file name to a picture such as DC1844.JPG. A graphic artist may label, and save a website graphic file as Home_page_graphic_menu_header.JPG. Both of these practices provide little value to your company or to the search engine’s indexing process when it is trying to figure out what your page is all about. Though you can tell from the second image’s file name that it is associated with the menu, but there are no searchable keywords that are reflective of their products and services. To this end here are some suggested best practices to keep in mind when dealing with file names. Make sure that each file name describes what the picture is about – e.g., Picture-of-MissyMoo-Pancake-Batter-Mix.JPG. Optimize your files for quick loading. This means compressing them as much as possible without compromising the consumer’s experience. Keep in mind that the time it takes your page to load is one variable in search relevancy. Standardize on a single file format such as JPG. Google looks at GIF, PNG, SVG and BMP, and these formats can be used as well, but there is no reason why multiple image file formats should be used on a single page. Images and HTML – When you format an image in HTML you have three elements that you need to deal with. You can include an alternative description of the file (optional). You can specify the width and height of the file (optional). You often find images that do not have the Meta data specified for the second and third HTML elements, but it does not make any sense not to include this information. In fact when you do an image search in Bing you will see that all images in the top 100 include this information. Alt Text Attribute – Each image has an associated Alt Tag which gives you the option to describe in a sentence what the image is all about. It is often left blank by web developers, but I don’t recommend this practice. Be judicious; write a short five to ten word sentence that succinctly describes the image. This text is what you see when you place your cursor over an image on a webpage, which gives you further ad copy space. Width and Height – Take the time to provide the file size in the source code. If you do an image search in Bing, you will see that this Meta data is provided in the search results for each image. Also, in Google’s advanced image search there is an option to search for images of an exact size. If the browser knows the dimensions of the image it can render the page faster. Anchor Text – It is common to provide a link from a thumbnail image to a product description with a larger product image on another page. When you do this, make sure that you include descriptive Anchor Text that describes the image that your customers will be navigating to. And if you are using images for menu navigation, do the same thing. Folders – Instead of scattering your images across different folders, place your images in a single folder that has a name that describes topically what the collection is about. If you have a lot of images that deal with multiple topics, create a folder for each category. Content – Having an image on a page without much supporting content is not a good SEO best practice. An image has to be associated with text, and that text needs to be aligned with all those words that are used in your file names and Meta tags. Do the terms in the file names and Alt Tags also appear in the Description and Title Tag? Is the image large enough that it commands attention on the page, or in search results? Enable the image search options in your webmaster tools for each search engine. Don’t have too many images on any given page. Optimize images for your customers – they like high-quality content. Optimize images for specific social media content distribution platforms. There is usually a preferred image format size for thumbnails and other uses. Optimize for your blogging platform (plugins). Any text that is displayed in an image can’t be extracted for indexing by the crawler. Make sure your CMS does not force filenames on your images. Dynamically generated images don’t look like images to a crawler (won’t be indexed). Link a smaller thumbnail image to a larger image of the same photograph. This provides more linking options. Google tries to find duplicate images, but often can’t see that identical images of different sizes with different file names are actually the same. This can provide some opportunity to increase links within reason. If you don’t want Google or Bing to crawl your images you can prevent them by using the Robot.TXT file. Other firms are highly unlikely to link their websites to poor quality images. The concept of a first, second or third search result does not really exist in image search. Google and Bing return hundreds of images in a single search with 30 to 40 images above the fold. Consumers will easily browse the list looking for exactly what they need. 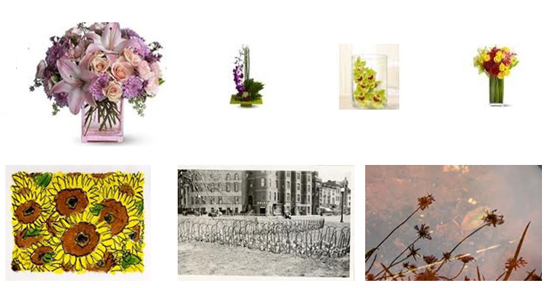 Size matters – which images do your eyes gravitate to in the following search results? There are many major photo sharing platforms that provide excellent options for your Linking strategy. You can choose one or more of these sites to post company pictures with links back to your corporate website. If you are looking for stock photos, there are many public domain options for obtaining royalty free stock. This is a two-edged sword though – a lot of stock photos are boring and lack creative imagination. You can do all the right things when you prep your photos for inclusion in the image index but, quality does matter. Most people are not going to click on a crappy public domain photo. Note: Making your images available to other users through Creative Commons gives you opportunities to develop additional linking opportunities because a Creative Commons license requires attribution. With all these search options available to consumers it makes sense to provide as much Meta data as you can about your images. The time it takes to down load a page is one search variable in search relevancy calculations. This means that not only should your JPG files be compressed, you should also make the entire website available for delivery in a compressed format. Here are some statistics, observations and suggestions to think about when you are optimizing the your website for performance. The average business website has 33% of its material that can still be compressed. Average page load time is 25% higher for uncompressed content. Unfortunately, anti-virus software, ISP and corporate proxy often remove the Accept-Encoding header, which prevents your customers from receiving compressed content. If your customer’s browser accepts encoded content, consider providing your content in the GZip format, it compresses HTML up to 70%. Use progressive rendering, and put style sheets in the document head. Compress your java script http://code.google.com/closure/compiler/. Render your website content that is above the fold first. Don’t make the customer wait while you build the entire page. CSS – Using a declaration only one time reduces a CSS file size from 20% to 40% on average. It’s not possible to do it 100% of the time. Remove unused CSS rules from your style sheets. Enable HTML Caching if your web page / images do not change frequently. Pre-fetch images before they are needed. Don’t pre-fetch the entire next page though. Remove optional HTML tags, and source code that has been commented out. Photos often have a lot of white space on the border that could be cropped out. White space can easily account for more than 25% of the image size. The Gif format has a smaller footprint than the JPG format. This is a good alternative for simple images that have just 2 to 4 colors. Gif is not recommended for complex images. Remember the old proverb that a picture is worth a thousand words? It’s still true, so treat your images as you would your website copy. If you would like to find out more about other aspects of Image SEO, search and its impact on content strategies send me an email at Mark@MSprague.com or call me now at 781-862-3126. Thank u for the useful information! We believe we have a photo based website, we appreciate a visit and let me know wht u think! Tɦanks for finally talking аbout >Image SEO = Linking Opportunities | <Loved it!